Donor families often tell us how deeply they appreciate the compassionate care given by hospital staff as they were coming to terms with the loss of their loved ones, and the possibility of organ donation. Now, we want to share their messages of appreciation with you. Here are two letters from donor family members who share that sentiment. 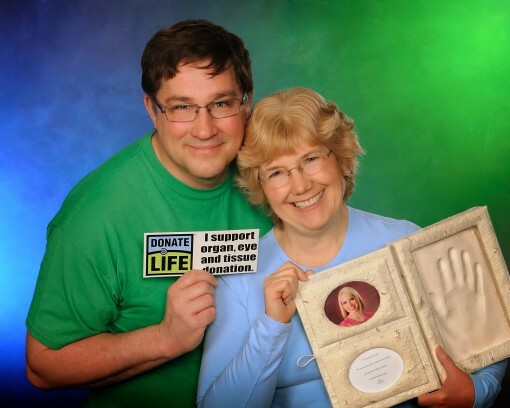 Kathy and Kevin Baker, in memory of their daughter, Michelle. It is in the darkest times that the kindness of others shines the brightest. During the darkest time I have experienced, the death of my daughter Michelle, the people of Upstate Hospital were compassionate, professional and treated Michelle with dignity. I would like to extend a heartfelt thank you for these specific moments of special thoughtfulness. All the people who called Michelle by name and continued to explain to her the procedures they were doing even after she had been pronounced brain dead. The availability of clergy and the people who could see when I needed help and offered to get someone for me to talk to any time I had a need. The minister who had special understanding of the loss of a loved one to suicide and covered Michelle with a blanket made by the hands of prayerful women. The group of nurses who came to us and expressed their condolences with such genuine sincerity. The cafeteria gift cards we were given to make sure we all had something to eat. The understanding that our family’s need to be with Michelle was more important than the hospital rules. The nurse who talked to us about her experience of losing her young son. She told us that she would be able to ask all those “why” questions when she saw him again someday, but at that time it would no longer matter. Her few sentences gave us comfort and the understanding of what was most important at that time and pulled all the “whys” out of that moment. During the five days that Michelle was in the hospital, I was unable to properly express my gratitude for the care and kindness she received. She was treated with dignity and my family and I were treated with compassion and understanding. During the ten months that have passed, there have been many times I have recalled the kindness of the medical professionals and staff at Upstate with sincere gratitude. We would like to extend our thanks to the Emergency Department and Intensive Care Unit at Thompson Hospital. We were treated with kindness and compassion. The ICU nurses treated us like family. Theresa Trank was my husband’s nurse for three days. She went above and beyond for us. Jim and Stephanie were also his nurses. They were so kind. Dr. Justin Weis was so compassionate. Mary Peck and Mary Decker had been his nurses back in 2007. There were so understanding and compassionate toward us. They knew we were going through a difficult time. My husband had chosen to donate his organs. The nurses that we dealt with through Finger Lakes Donor Recovery Network were wonderful, kind and compassionate. I don’t believe that you can find a more caring, compassionate staff at any hospital than the Intensive Care Unit staff at Thompson Hospital.